Ever wanted to know where Australia’s seafood comes from? What the Australian seafood industry does to ensure its seafood is sustainable? Or where the top restaurants go to get the freshest of the fresh? 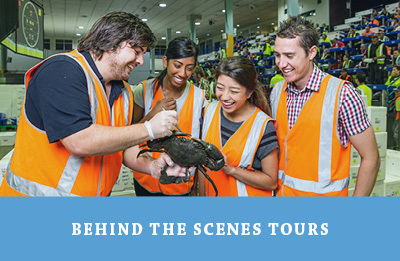 On a behind the scenes tour of Sydney Fish Market you'll have all these questions answered and more! Your guide will explain the history of Sydney Fish Market and the workings of the Dutch auction clock system. You will then be led through the auction floor, viewing the freshest seafood available – including live crab and huge tuna! Learn about sashimi, watch oysters being shucked and view the displays in our specialist seafood retail stores. Sydney Fish Market is the largest market of its kind in the southern hemisphere and the third largest seafood market in terms of variety in the world. About 2,700 crates (50-55 tonnes) of the freshest possible seafood is auctioned each day, through the computerised Dutch auction system, to around 160 buyers. The incredible variety of seafood is sourced from individual fishermen, co-ops, fishing businesses and aquaculture farms in Australia, New Zealand and the Asia-Pacific region, with over 100 species available to buyers daily. What you will experience on the tour? Go behind the scenes with one of SFM’s trained guides to explore all facets of the market. Hear the history of Sydney Fish Market. Learn how the Dutch auction and buying system works. Tour the auction floor, viewing over 100 species. Meeting point is outside Doyle's Restaurant in Sydney Fish Market's Waterfront Arcade. View our Retailer Map. In the interests of safety, the minimum age of tour participants is 10 years of age, this includes new born babies in carriers. Please note, there are no exceptions. Parking at Sydney Fish Market is included - just bring your parking ticket with you to the tour and we'll validate it. Due to occupational health and safety concerns, all visitors to the auction must wear enclosed shoes. Those who do not wear enclosed shoes will not be granted access to the auction floor. roll up your long pants/jeans. SFM tries its best to accommodate school and group tours. Small groups of up to 10 people may be accommodated on a regular behind the scenes tour on any weekday. Bookings essential and places are subject to availability. Payment for all tours must be made at the time of booking. No refunds will be issued . Please ensure that the group arrives promptly by 6.40am. offer wheelchair access to the auction floor portion of the tour.